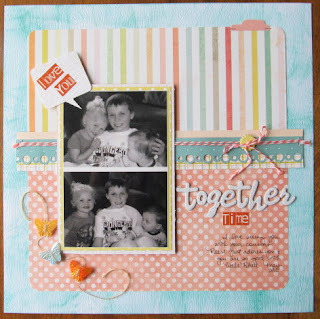 When I saw the sneaks for the June Studio Calico kit So Cal, I didn't love it. But, I didn't dislike it. I was actually kind of excited about the large assortment of embellishments. (OK, minus the butterflies.) Then the reveal came and I wasn't tempted to buy any of the add-ons or even the add-on paper. This month is was a kit only month for me. The kit arrived and I tore into it immediately like I always do. I'm not a very patient person. Everything was pretty. And then I put it all back in the box and closed it. No ideas for anything popped into my head. I had a fresh supply of printed photos and finally decided to go through them and scrap whatever I could with the kit. I was worried if I didn't use it now that I probably never would. For some reason it just didn't excite me. I think the colors may have been too washed out for me. I thought the last day of school pics would work with the alpha and number papers from the kit. I grabbed some old library cards I had in my stash and cut them down to make tags. 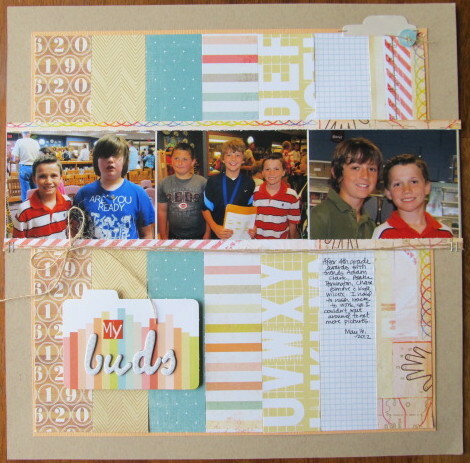 This layout is inspired by Waleska Neris' layout on page 90 of Simple Scrabooks. 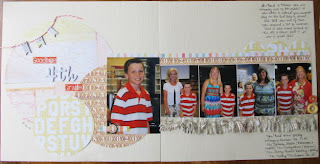 I used Suzy Plantamura's layout on page 95 of Simple Scrapbooks as a starting point for this school awards page. I thought the map paper and border had a sort of "oh, the places you'll go" theme. I inked the white woodgrain cardstock that came in the kit for this layout of Kevin with his cousins. I just LOVE how Reese put her hand on his shoulder to pose in the top pic. 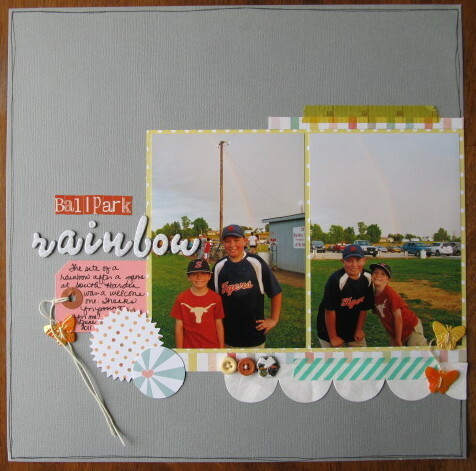 Again, I used my butterflies on a Reese page! I have to admit that I did like the patterned papers in this kit. So, I used a lot of them in small strips on this layout of Kevin and his friends. 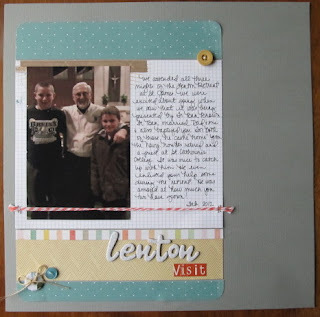 Back in February, we had a great time catching up with an old family friend, Fr. Ben, at the Lenton retreat at our church. I went with a simple layout to tell that story. I also took inspiration from Mandie Pierce's layout on page 30 of CK's Simple Scrapbooks idea book. I used butterflies and pink on a BOY page!Added the pink tag and washi from my stash. This layout is a lift of Maggie Holmes layout on page 35 of Simple Scrapbooks. 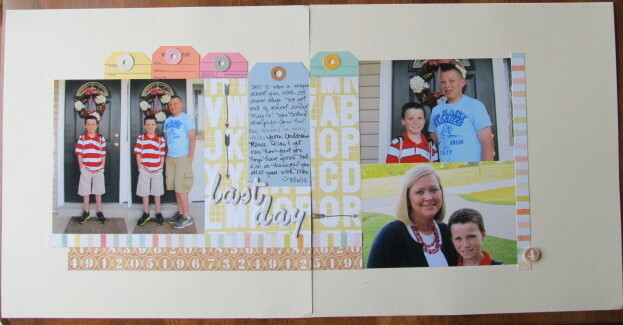 I failed miserably at keeping up with Project Life this year, but still snap pics of my everyday life every so often. 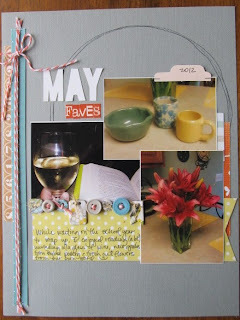 I had captured some of these random shots for May and decided to just scrap a page for my personal album. I had fun visiting a store (A Little Bit of Bybee) for the first time and snagging some pottery, I relaxed many nights reading with a glass of wine, and I also enjoyed our blooming lillies by bringing some of them inside. Plus, this was a good way to use up the buttons in the kit! 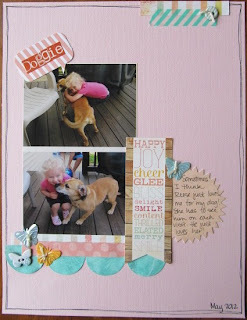 This is the second time I used Kim Watson's layout from CK's Simple Scrapbooks as inspiration for a layout. 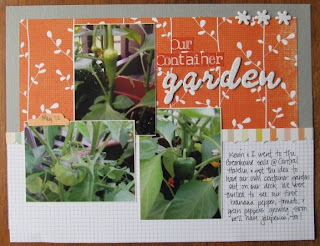 Finally, I finished my kit off with this simple page documenting our first ever container garden. We have produce! 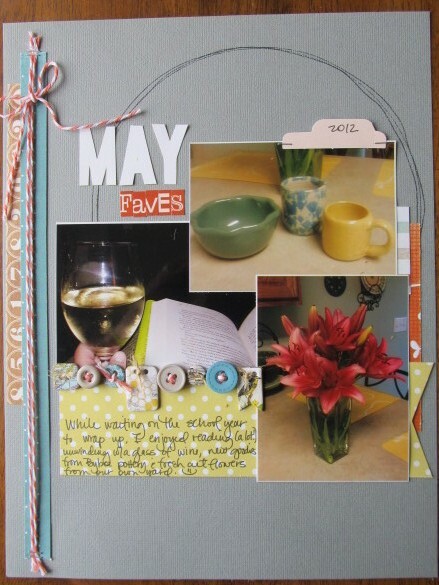 Now that I have my June kit "killed" and out of the way, I can scrap with older supplies in my stash while I anxiously look forward to SC's July kit. The colors seem to be a lot more my style. All I can say is "WOW!" I'd hate to see what your pages looked like if you really LOVED the papers! lol! 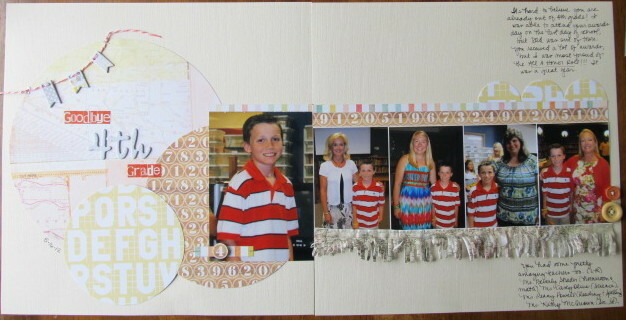 These are all super, I love how you mixed the patterns!